Hockey came full circle for the Johnson family in August. Longtime Anaheim Jr. Ducks defenseman Ryan Johnson committed to the University of Minnesota, the same school his father, Craig, played for in the early 1990s. “I went on a couple of visits there and just fell in love with the school,” Ryan Johnson said. “The campus is unbelievable, and the hockey history is unbelievable. All of the schools that recruited me were great, and it was a tough choice. That half of the family tree is planted in the Land of 10,000 Lakes didn’t hurt either. Craig Johnson, Ryan’s longtime coach and the Jr. Ducks’ director of coaches, grew up in St. Paul, Minn., and was a renowned high school player before scoring 135 points in three seasons at Minnesota. A 1994 U.S. Olympian, he then played 14 pro seasons, several with the Los Angeles Kings and Mighty Ducks of Anaheim. Ryan Johnson, an Irvine native, is one of 18 players with ties to the Jr. 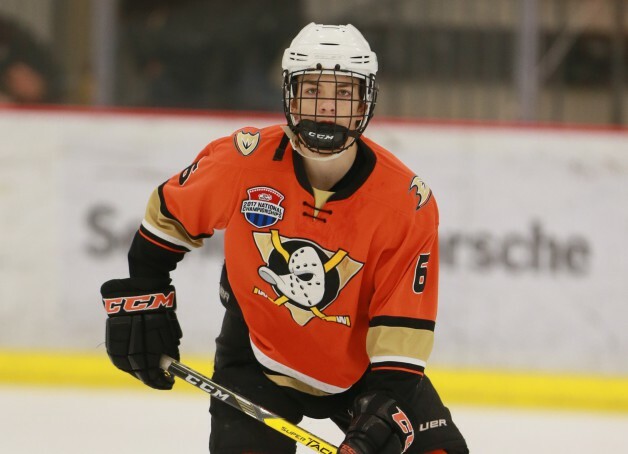 Ducks to commit to an NCAA Division I school in the past four-plus years, a group that also includes recent commits Rory Herrman (RPI), Ethan Wolthers (UMass) and Jerrett Overland (Air Force). Johnson put up 60 points in 45 combined CAHA and Tier 1 Elite Hockey League games last season, but Alex Kim, his 16U co-coach, said points don’t tell the entire story. Johnson, the highest-drafted Californian ever in Phase I of the USHL Draft (third overall, 2017), will play for the Sioux Falls Stampede this season. He is scheduled to enroll at Minnesota in 2020.